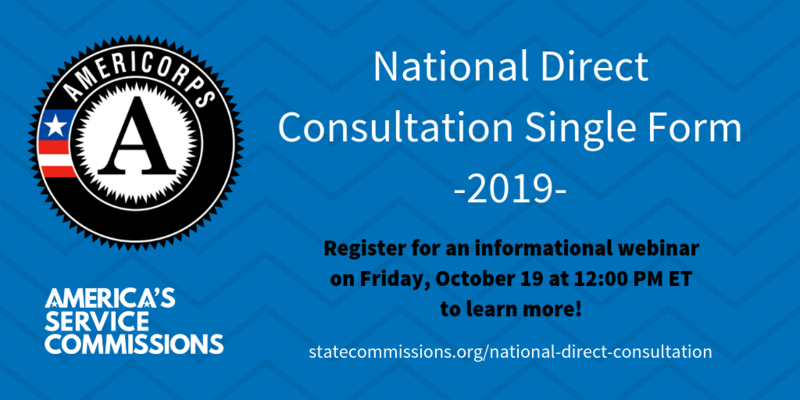 America's Service Commissions is pleased to continue the online National Direct Consultation single form to initiate and streamline consultation between multi-state applicants and state service commissions. For the FY19 AmeriCorps NOFO, 45 of the 52 state service commissions are participating in the single online form. If a state is not participating in the pilot (Guam, HI, MO, NJ, NM, Puerto Rico, TN) you should contact them for directions on how to initiate and complete consultation for their state. By completing the online form found here, multi-state applicants will initiate consultation for those participating states. Click here for a pdf of the form for your reference. Some states may have additional requirements to complete consultation, which they will communicate to you via email after the form is submitted. Multi-state applicants should submit the online form no later than the FY19 AmeriCorps application deadline set by the Corporation for National and Community Service. For more information regarding consultation requirements review the FY19 AmeriCorps NOFO on the CNCS website. Watch the information webinar hosted on October 19, 2018 for additional information. View the webinar slides here. It is strongly encouraged that multi-state applicants (national directs) contact the state service commission(s) as early as possible in order to begin a dialogue related to your proposed placement of AmeriCorps members. This may help inform your application to CNCS based on suggestions the state service commission(s) may offer based on need in the state, existing AmeriCorps program placement, and other factors to consider. CNCS expects Commissions and National Direct applicants to consult and coordinate activities at the local level, as specified in Section 131 of the NCSA (42 U.S.C. § 12583). This consultation is designed to ensure the most effective use of national service resources and lead to enhanced coordination. The list of Commissions can be found here: http://www.nationalservice.gov/about/contact-us/state-service-commissions. Consult with the Commission of each state and/or territory in which the organization plans to operate and describe this consultation in their applications. Contact the Commissions for details about the consultation process. Provide information that connects the proposed activities to the current State/Territory Service plan and/or State logic model. Provide the Commission with contact information for National Direct programs in the state and/or territory and update the information on an annual basis. Participate in the Commissions’ annual needs assessment and training plan development activities, and in the development of its state/territory service plan, as well as appropriate training and other events. Include the Commission on the National Direct’s mailing/email distribution lists and invite it to appropriate training and other events. Consult in a timely manner with the National Direct applicants, except Indian Tribes, that contact them prior to application submission. Consider the schedules and needs of National Direct applicants, including Indian Tribes, operating in their states when planning annual events and technical assistance activities. Include National Direct programs, including Indian Tribes, in their annual needs assessment and training plan development activities, and in the development of their state/territory service plan. Add staff of multi-state programs in their state/territory to their mailing/email distribution lists and invite them to appropriate training and other events. CNCS will solicit Commission input on National Direct applicants, except Indian Tribes, proposing to operate in their state/territory. Via the CNCS’s web-based management system, Commissions have the opportunity to select “support,” “do not support,” or “neutral,” and provide comments. Participation by Commissions in providing this input is strongly encouraged. CNCS reviews and considers Commission input on multi-state applicants proposing to operate in their state.